I don’t get motion sickness. Ever. Not in cars, on boats, or on planes. Not on rollercoasters or Gravitrons. 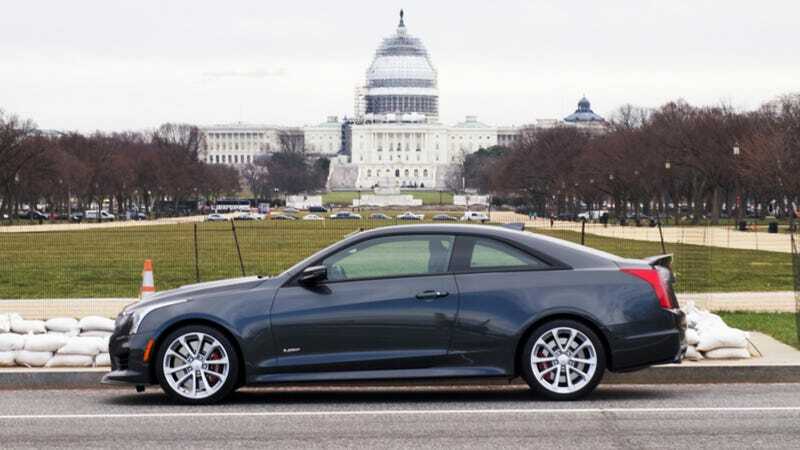 But the Cadillac ATS-V is so fast, it actually made me puke. I should probably clarify that I was in the back seat of one last year, while going through the twistiest mountain roads California can possibly imagine, which didn’t help. But still, it’s the first one ever to make me encounter that less-than-joyful experience. I can’t definitively say, one way or another, whether it was the whole sitting-in-the-back-seat-of-a-car-that-already-doesn’t-have-the-best-visibility-in-the-entire-world thing, or the fact that my former boss and permanent maniac Matt Hardigree was doing the driving, or really any one of a number of factors. But I’m going to choose to blame the semi-secret option menu in the Cadillac. A lot of road cars with track capabilities give you an option menu these days, in order to allow you to set exactly how fast you want to go. Sir would like a little slippage, but not too much? Or would sir like a completely banshee full of vomit? Technically, that’s not an option on the Caddy, but if you push enough buttons, it’ll feel like it. Normally in the ATS-V you get a few choices of traction control, throttle response, steering, and suspension pliability. The standard choices include “Tour,” “Sport,” “Track,” or “Snow/Ice.” Tour and Snow/Ice are predictably muted, with the engine noise being toned way down, the steering feeling light and even a bit vague, and the suspension turning a car that looks like a scalpel into a nice cushy seat. Because no one actually wants to sit on a scalpel. Sport makes the throttle lightning-quick, makes the twin-turbo V6 455-horsepower engine sing like the angriest bird in the world, and gives that suspension just the nicest little bounce. Track does all of that, but more. And then there’s the Performance Traction Management system, which is so dryly-titled you know it has to be good. Is it a secret? Not really, not as much as something that’s actually in the owners manual could be a secret. But it’s not like there’s a blaring sign saying EXTRA SPECIAL GOODIES HERE. If you never check the manual – and I know a hell of a lot of people that don’t no matter how much they’ll deny it – you’ll never know it’s there. Make sure the car is in Track mode, using the regular “mode” buttons on the center tunnel, right by the shifter. Once it’s in Track mode, hit the traction control button on the steering wheel twice. You don’t have to hold it down or anything, but you do have to be deliberate about really wanting to mess with the traction control system. Now you’ve got a stew going. Go back to the “mode” buttons, and go nuts. Once you’ve gotten into the PTM menu, your new options are no longer limited by the chains of the traditional electronic bells and whistles. Now, you get new options. Better options. Wonkier options. First up there’s WET, which is for, well, wet race tracks. DRY is for, funnily enough, dry situations, and mostly just puts the stability control system (the one that works the brakes, not the throttle) into a looser setting. Then you get to the really fun ones. SPORT 1 lets the throttle-based traction control slip a bit for effortless drifts, and turns the stability control system down ever more. SPORT 2 still allows you to slip with the traction control, but turns the stability control off completely, turning the whole thing into a twitchy yet joyous handful. That’s like something a German engineer says when he’s trying to say “it will detach your face-skin from its normal position.” And damn if it isn’t brutal. Got an ATS-V? Want to try all of this stuff out on your own? Try not to kill yourself doing it, and then let us know your own experience in the comments below.